This is a somewhat specialized workflow, but for those who read Greek and Latin, it will likely prove beneficial. This workflow uses the Perseus parsing backend to allow full parsing of both Greek and Latin terms. 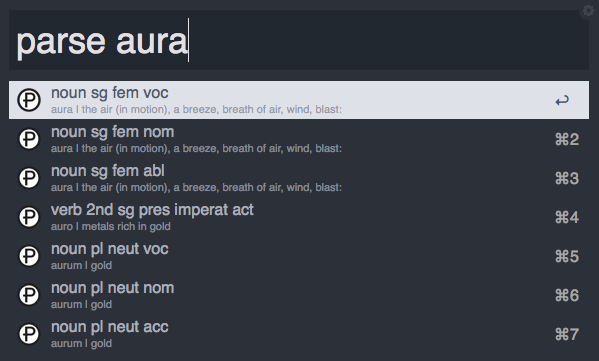 Simply use the keyword parse followed by the unknown Greek or Latin word. Parsers will automatically fetch all of the parsing data from Perseus, munch it up, and offer you all of the possible parsings via Alfred's elegant UI. If you would like a bit more information, Parsers adds two actions for any selected parsing. Using cmd+return, you can view a HUD of the parsing data chosen, pretty printed, and have that data copied to the clipboard. Alternatively, you can use shift+return to view a HUD of the lexicon entry for that parsing term, and this lexicon data will also be copied to the clipboard (NOTE: Parsers will attempt to display the lexicon entry from the most concise lexicon available for the chosen term). 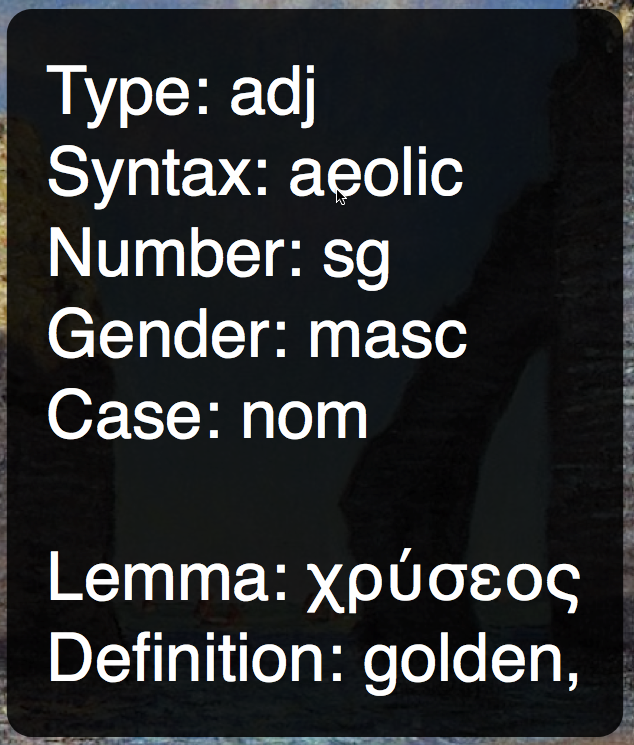 Updated to Version 1.1.1 with fixes for Latin lexica. UPDATE: I have just pushed version 2.0 to Packal. This is a total rewrite, but it keeps the essential UI. Use a keyboard shortcut or the Script Filter to get parsing options. Then, either  directly copy that parsing info,  copy a nicely formatted version of the parsing info, or  (this is the newest part) look up that lemma in a lexicon. The lexicon lookup with show a webview with a cleaned-up, well-formatted version of the lexicon entry. This text is selectable and copyable, and is much easier to read than on Perseus' website. Thanks for sharing this interesting workflow. However, i get an error when I try to run it: 'nonetype' object is not iterable. I'm running Yosemite, maybe that's why? Incidentally, when I first run it, I was asked to authorize something (sorry but I don't remember what exactly) to always run. Is that normal? Thank you! Can you run the workflow with Alfred's debugger on, and then post the debugger output? I need specific line numbers and such. Also, the authorization was to download a dependency. I'm using an early version of a workflow utility to allow workflows to download utilities at runtime, instead of bundling them all with the workflow. This reduces the size of the workflow itself, and thus alleviates user's Dropboxes (if they are syncing). Damn. If I had a nickel everytime I made that error, I'd probably have a dollar. I accidentally hardcoded the arguments for the workflow in the script file. Wow, that was quick! Works perfectly now (in Yosemite, too). Thank you so much! Thank you for this fantastic Workflow. In my case however it works only partially. The query is parsed in Alfred in the actions' window, but I cannot get Alfred to display anything in this dark big HUD through ⌘⏎ or ⇧⏎.